This is a 1971 Commemorative Trading Card. Its text is now obsolete. The Dodgers send Rich Hill to the mound tonight while Alex Cora is still puzzling over who he might start for the Red Sox. The options range from logical (Eduardo Rodriguez) to highly intriguing (Chris Sale on three days’ rest) to someone who would be utterly stunning (Pomeranz). The Athletic recounts the Muncy tale from unemployed to Game Three hero. For those who wonder whether a powerful Game 3 showing by a star pitcher can swing a whole World Series, even if that ace’s team trails by two games when he takes the mound, I refer you to Game 3 of the 1978, ’81 and ’85 World Series. Ron Guidry, Fernando Valenzuela and Bret Saberhagen were the complete-game star pitchers for the Yankees, Dodgers and Royals. All three of their teams came back to win the Series. Amazing facts about Game Three. 2017 Yu Darvish has his first bad outing of the postseason, giving up four runs in 1 2/3 innings in Game Three of the World Series. The Dodgers couldn’t come back against the Astros’ Lance McCullers and Brad Peacock and fell behind two games to one. 2013 Johnny Gomes hit a three-run homer off the Cardinals’ Lance Lynn in the sixth inning and the Red Sox won Game Four of the World Series. RHP Lance Lynn (4-2, 2.78 ERA) goes for the Redbirds and LHP Clayton Kershaw (7-2, 2.15 ERA) pitches for the Dodgers. Five of Lynn’s six career starts against the Dodgers have come in LA, where he hasn’t pitched past the sixth inning and has a 4.68 ERA. This season he’s given up eight HRs in eight starts, only five fewer than he gave up in 31 starts last year. Kershaw is 6-5 against the Cardinals in the regular season, but 0-4 in the postseason. On the other hand, he has a career 3.18 ERA in 15 regular-season appearances against them — and an even better one (2.75) at home. He’s coming off a win against the Giants in which he went seven scoreless innings. 2002 Shawn Green hits four home runs (video) in one game to become the 14th player in major league history, the second this month, to accomplish the feat. The Dodger right fielder’s 6-for-6 performance in Milwaukee’s Miller Park, which also includes a single and double, breaks Joe Adcock’s 1954 mark for total bases by one, with a total of 19. 2002 In the same game the Dodgers set a franchise mark when the team hits eight home runs in one game, bashing the Brewers, 16-3. Shawn Green’s four homers account for half of the record-breaking barrage with Brian Jordan, Hiram Bocachica, Adrian Beltre, and Dave Hansen also contributing round-trippers in the Miller Park contest. The Dodgers reinstated Logan Forsythe from the DL and optioned Josh Ravin to OKC. The Cards and Dodgers play Sunday Night Baseball. It’ll be Zack Greinke for the Dodgers versus Lance Lynn for the Cardinals. Greinke’s last game was astonishing because it was the first bad one he’s had all year: he gave up ten hits and five runs to the Rockies over six innings. Even with that aberration, he’s 5-1 with a 1.97 ERA on the year. Lynn is 4-4 with a 3.03 ERA on the year. His last start was his best of the season: he went 7 2/3 scoreless innings against the Brewers. Matt Carpenter’s bruised triceps makes him day-to-day for the Cardinals. Turner hitting cleanup? I’ll bet he hasn’t done that since high school! I know, I know, nobody cares. Well, in the interest of full documentation, I’m putting up a post about these games anyway. Jake Peavy for the Giants, Lance Lynn for the Cardinals. The Cardinals need to win to even the series at a game apiece. Peavy is 6-4 with a 2.17 ERA in 12 starts with the Giants this year after going 1-9 with a 4.72 ERA with the Red Sox. Lynn was 15-10 for the second year in a row while shaving his ERA from 3.97 to 2.74. Here. This may brighten your day. After winning Game One the Giants hope Tim Hudson (9-13, 3.57 ERA; 1-3, 3.46 ERA postseason) can keep the momentum going. They’re facing Jordan Zimmermann (14-5, 2.66 ERA; 0-1, 11.25 ERA postseason), and all he did his last time out was pitch a no-hitter for his fourteenth win. The Giants have won nine straight postseason games. 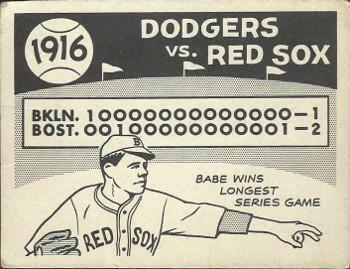 The record is twelve, held by the Yankees (twice), the As and the Red Sox. The Dodgers have to shrug off yesterday’s stunning loss and regroup, and they’ll send Zack Greinke (17-8, 2.71 ERA; 2-2, 4.30 ERA postseason) out to face Lance Lynn (15-10, 2.74 ERA; 5-4, 4.81 ERA postseason). Dan Haren (8-6, 4.23 ERA) starts for the Dodgers. He undoubtedly hopes to stop giving up home runs in great numbers (17 in his last 12 starts!) for the remainder of the season. Lance Lynn (10-6, 3.14 ERA) will pitch for the Redbirds. The 23-year-old, second-year pro became one of six players in Dodgers history to record 100-plus hits, 40-plus extra-base hits and 50-plus RBIs before the All-Star break with 106 hits, 44 extra-base hits and 52 RBIs. Other players in Dodgers history to accomplish the feat include Duke Snider (1954), Willie Davis (1973), Steve Garvey (1977), Gary Sheffield (2000) and Matt Kemp (2011). That’s some pretty good company right there. Also from Twitter: The #Dodgers today recalled Paco Rodriguez from @AbqTopes. They had roster space because they optioned Pedro Baez back to the Isotopes on July 13. Zack Greinke (9-4, 2.89 ERA) and Lance Lynn (8-4, 2.90 ERA) are two of the league’s leading righthanders. They face off against one another this afternoon on national television. Lynn last pitched against the Rockies and gave up three hits and no runs in 8 innings. Greinke is coming off what might be his worst outing of the year, giving up five runs and eleven hits to the Royals in 5 2/3 innings. Shake it off, Boston. If you want to win this Series you have to get over that ninth-inning calamity. Hey, if David Ross had been catching he might not have thrown the ball into left field in the first place, which would have ended the play right there. The Red Sox and the Cardinals are back at it at 2:00pm HST, 5:00pm PT, 8:00pm ET on Fox. Clay Buchholz apparently has a tired arm, but he gets the start for the Sox regardless. The Cards send Lance Lynn to the mound on 11 days rest.